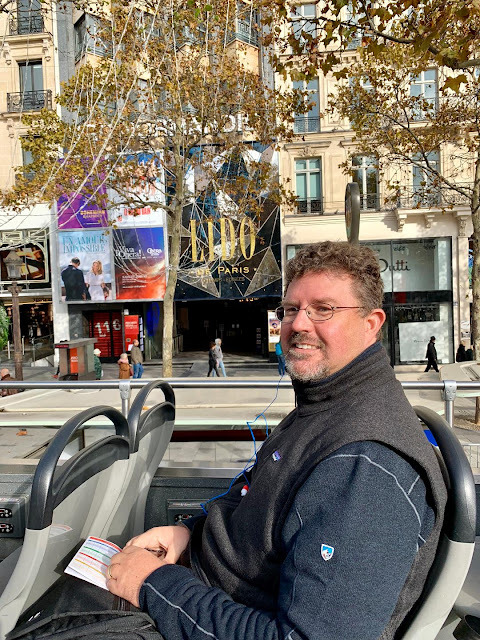 On one of the days we were in Paris, Ed and I decided to do the Open Tour Bus - known in most cities as the Hop-On Hop-Off bus tour. It travels a route through the city and you can stay on the bus through the entire day or get off to explore at different points, getting back on when you're through with your sightseeing of that area. Ed and I decided to stay on the entire route and see the city. We only had a few days there and I really only had two must-sees on my list - the Mona Lisa at The Louvre, and the Eiffel Tower. 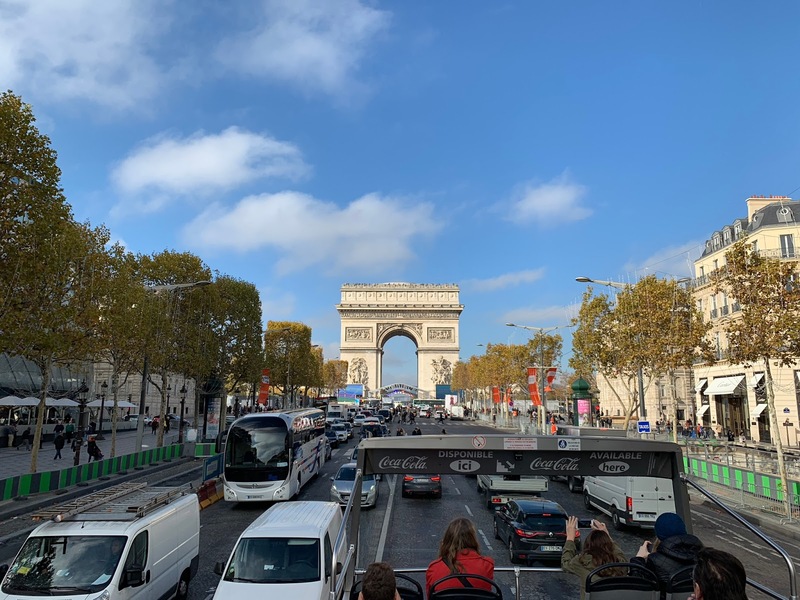 We decided we didn't need to go up in the Eiffel Tower, just wanted to be close enough to see it and take pictures, but we did want to see other attractions and neighborhoods in the city. The Eiffel Tower from the Plaza Trocadéro. 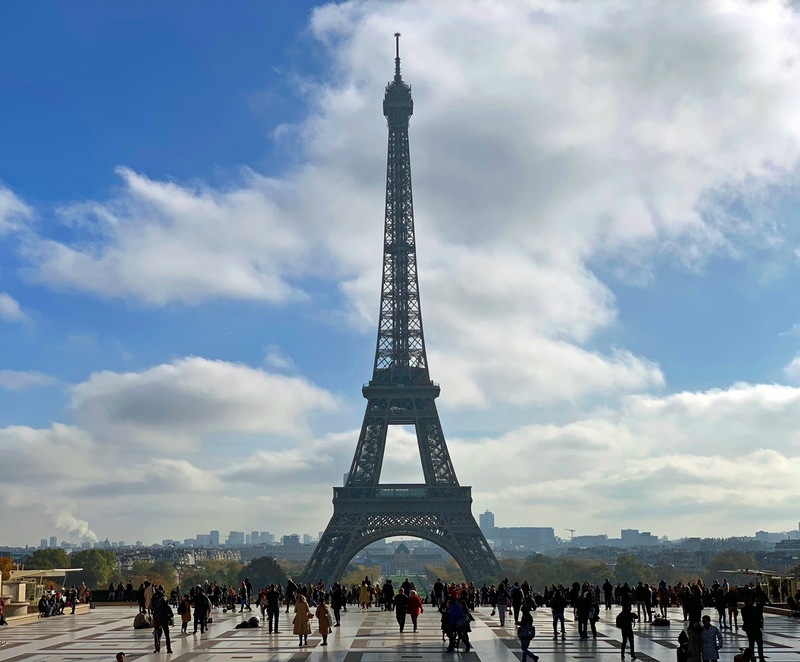 The company offered three tour routes, passing by most of the best-known landmarks - the Arc de Triomphe, the Palais Garnier Opera House, the Louvre, the Musee d'Orsay, Notre Dame Cathedral, the Eiffel Tower, and more. The company provided us with a set of earbuds (ours to keep) and offered the tour in multiple languages. We just picked a seat, plugged in, choose our language, and listened to the tour narration. In spots where there wasn't something significant to point out, they played lovely French music. It was a great experience. A view of the Arc de Triomphe from the Avenue des Champs-Élysées. The bus took us down the world-famous Avenue des Champs-Élysées, through the beautiful 7th Arrondissement neighborhood where the Eiffel Tower is located, and past the bouquinistes selling their wares along the Seine River. 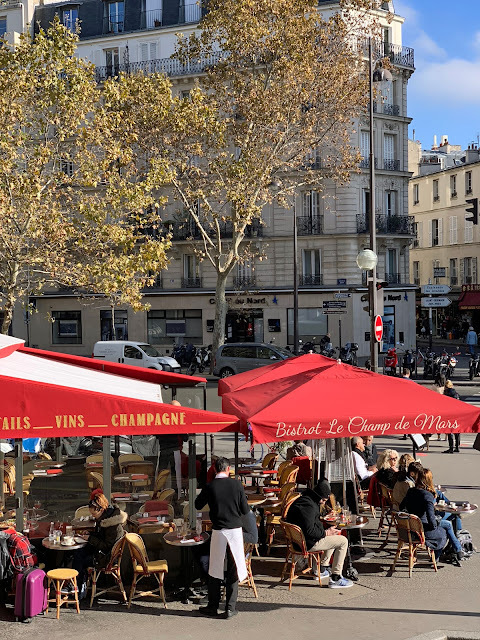 We passed neighborhood cafes teeming with patrons sitting outside enjoying the weather, and saw pockets of the city we never would have never been able to cover on foot in our short visit. It was a beautiful day - sunny and crisp - and although it did get significantly colder as we neared the late afternoon, it was still bearable. Ed transitioned into his packable down hoodie, and I wrapped my scarf around my head to shield myself from the wind. Even in the cold, it was a perfect day. I couldn't imagine being on the top of a bus in the heat of summer, but the chilly Fall weather was ideal. The day was glorious! Ed and I hopped off for lunch, walked through a cute little neighborhood before catching the bus at the next closest stop, and had a nice chat with a couple from New York while buying a pastry for our dessert. 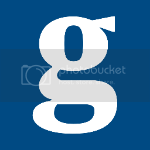 We're going to continue to take the open top bus tours in whatever cities offer them. 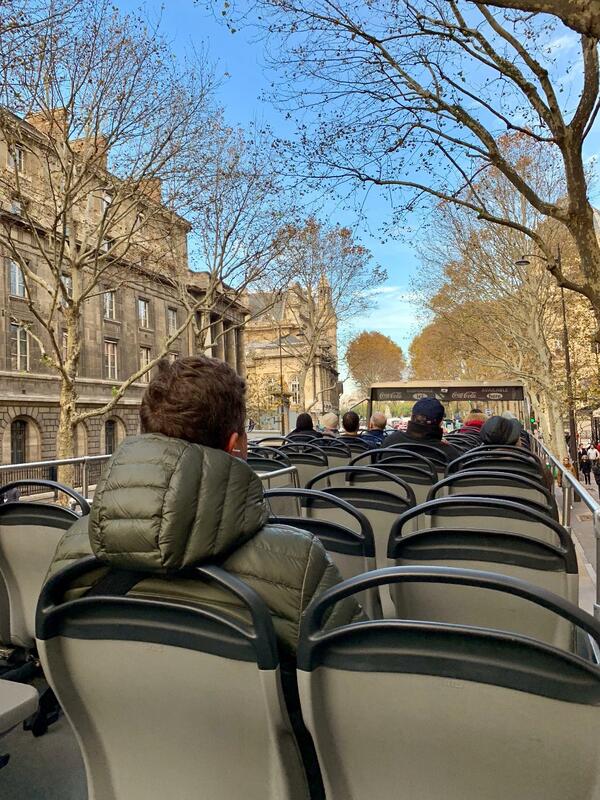 It's a great way to see what the city has to offer and having a one-day or multiple-day ticket, that allows you to get on and off when you want, makes the most of your time and makes it easy to map out a plan for more sightseeing. This was a vacation win!